I was first introduced to Chiropractic care at 19 years of age because of migraine headaches. Up until that point in my life I was under the impression that Chiropractors just treated low back pain. After nearly a week of suffering with an intense migraine headache, and after multiple visits to various medical doctors, he decided on his mother’s advice to try a chiropractor. The initial adjustment provided almost instantaneous relief and essentially became the catalyst for his attending school to become a Doctor of Chiropractic. 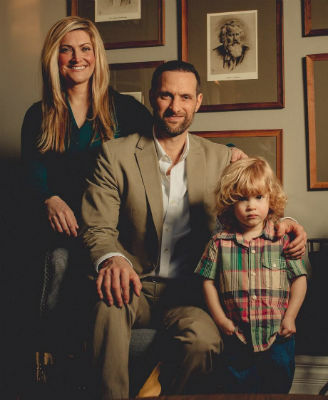 Dr. McCauley is a 2000 graduate of Life University in Atlanta, GA.
Dr. McCauley is married to Amy McCauley, a resident of downtown Rochester and an avid musician who’s been performing around the Detroit area since 2000. He works with a local record company called Lazy Daze Records to seek out, record, and book the best new entertainers Michigan has to offer. Chiropractic is a philosophy that Dr. McCauley lives by. Since his introduction to Chiropractic care in 1988, whether it be playing the guitar, swinging the golf club, or just making it through a Michigan winter avoiding the cold or the flu, Dr. Ken has regularly utilized Chiropractic care to increase his optimum level of health and performance. Thanks for visiting our site. We look forward to meeting you in person and learning how we may be of service to you. Feel free to call or email the office and Dr. McCauley will answer any of your health related questions.